(NewsUSA) - Congratulations, guys, on being so in love that you can save yourself at least one big headache this holiday season. Yes, for those wondering, if you're planning on popping The Big Question -- marriage, that is -- a diamond engagement ring can also count as her Christmas or Hanukkah present. "If a guy's gonna pop the question eventually, he might as well use the opportunity to avoid shopping for a holiday gift and kill two birds with -- ahem -- one stone," the Washington Post declared. And you won't be alone: While 39 percent of all marriage proposals occur between Thanksgiving and Valentine's Day, what sane-thinking male wants to be the one who waited till February to give his girlfriend a ring she was expecting in December? MYTH: You need to be prepared to spend two months' salary on a ring. FACT: That's just a guideline. Your financial circumstances -- and your girlfriend's taste -- ultimately rule. MYTH: There's no way of telling whether a diamond has been produced "ethically" or not. 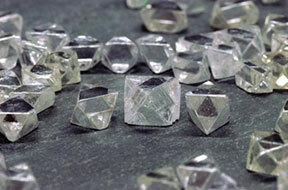 FACT: This is a big issue for some couples, so know that the Diavik mine in Canada's North West Territories, for one, has gone to great lengths to provide buyers with proof that it's adhering to international standards of labor, health, safety and environmental practices in producing the nicely sized diamonds of good color and gem quality it's famed for. "Each certified gem is laser-etched with a unique number that indicates the date mined, and each gem's unique optical fingerprint is recorded in an international database so that it can be positively identified," says an expert in the field, noting that many insurance companies offer discounted rates in such cases. MYTH: Most women want a pear-shaped diamond engagement ring. FACT: Round diamonds are the most popular. MYTH: You must pick the ring out yourself in order to maximize the effect. FACT: Thankfully, no, so you've dodged a bullet there. But if you prefer shopping stag, at least have your girlfriend's hints in mind. Finally, about those other diamond jewelry gift-gifting tips we promised. "Classic diamond stud earrings will never go out of fashion," says jewelry and style expert Michael O'Connor, "and diamond line bracelets can be worn with any outfit."